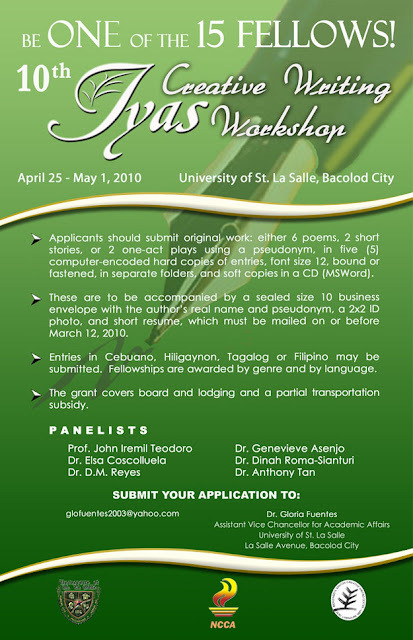 I have attended the 5th batch of IYAS Creative Writing Workshop in the Summer of 2005 as a writing fellow for Tagalog poetry and have met really talented (not to mention award-winning) young writers. Hope you join too and try your luck this year! Please note that in the third bullet point above, language also includes English & Kinaray-a. It must be tough to become part of this. How did you apply then? Hi Janette. Yes, it's really not easy to get to any national writers workshop such as IYAS. I just sent in my entries and wait for the result after about a month. I just tried submitting an entry every year (hoping for luck to come) until my entry was chosen in 2005. In 2004, I was in the waiting list only. Hi there! I'm glad to have come across your blog since I really need to know whether they accept submissions in English. I've been e-mailing Ms. Fuentes but she doesnt reply. Anyway, I really hope they do accept English works. I tried last time in 2008, under Filipino short story, I was in the waiting list. Hi Ewong. I also emailed Dr. Fuentes a long time ago but there was no reply. I think they also accept English coz they have panelists for English pieces. I think I have to make kulit to a faculty from USLS for the peace of everyone. I'll update this blog. Thanks for dropping by. screening lang ako..ok lang na wala ko ndala sa final screening at kahit pa ano ok lang..its God's plan basta sinabi ko lang sa kanya..bahala kana..basta watever may happen..ma control ko lang sana..
Hi, are there already results? If yes, where are they posted? thanks! @STANLEY: Ok lang yun. What entry did you submit? Try lang nang try. Ako man, I tried for a few years din bago ako nakapasok. @KRISINI: Is your name in the list? Please check the link i provided.